Die DQHA Horsemanship Camps lassen nicht mehr lange auf sich warten! Jetzt anmelden - Die Anmeldeformulare und weitere Infos finden Sie hier. Ich bin der Besitzer von Armstrong Equine Services; einer Deckstation sowie Zucht- und Trainingsstall in La Mesa NM, und einer Herde von über 30 Zuchtstuten auf der Willow Creek Ranch in Kaycee Wyoming. 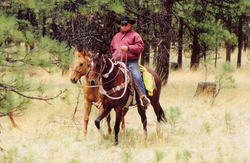 Ferner bin ich pensionierter Professor für Animal and Range Science an der New Mexico State Universität und Gründer des NMSU Pferde Programs sowie Mitbegründer der Suzanne Norton Jones 4-H Schule. Als AQHA Richter richte ich Shows auf der ganzen Welt. Seit 1999 betreue ich die DQHA Horsemanship Camps und komme jährlich mit einem wechselnden Team gerne nach Deutschland um drei Horsemanship Camps durchzuführen. Ashton and Sidney Dunkel grew up on their family ranch near Archer City, Texas, surrounded by the wide open spaces, horses and cows. 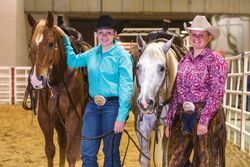 They both were riding horses before they could walk, and quickly took to showing horses and cattle through the Texas 4-H program. As teenagers, they met professional trainer Ben Baldus who was working at the historic W.T. Waggoner Ranch. They were offered the opportunity to intern with Ben at the ranch, and then followed him to Bowie, Texas, when he opened his own training facility. Both ladies volunteered their time, riding anything from green twoyear-olds to finished reiners and cow horses. There, they learned to train their own horses for a variety of disciplines. Both were very successful as youth riders, winning Texas 4-H State Championships in a variety of classes including Reining, Working Cow Horse, Stock Horse Trail and Stock Horse Horsemanship. They were also very active in horse judging, where their team won a state championship and placed in the Top 5 at the All American Quarter Horse Congress and the AQHA Youth World Show. Ashton made the finals at the AQHA Youth World Show multiple times in boxing and working cow horse. She was recruited by the Texas A&M Women’s Equestrian Team and just finished her third year riding for the Aggies specializing in reining. In 2017, she helped the team win their 12th National Championship. Ashton is studying Agricultural Leadership and Development at Texas A&M, and plans to pursue a Master’s Degree upon graduation. She volunteers her time helping with the Texas A&M Stock Horse Team, as well as other community service activities. Sidney was a two-time AQHA Youth World Champion in Versatility Ranch Horse and was AQHA Youth Reserve World Champion in Ranch Riding. In 2015, she won the AQHA Youth High Point Year End in Versatility Ranch Horse. She was also a threetime Texas 4-H Stock Horse All Around Champion. Sidney joined the Texas Tech Ranch Horse Team in 2017 and competes in stock horse competitions across Texas. She is completing her freshman year at Texas Tech working on an Animal Science degree. She plans to attend vet school and would like to specialize in equine sports medicine.